The barkeep of the acclaimed Kimball House in Decatur, Ga., adds to our cocktail series with a brown-liquor concoction that inspires us to new levels of precision — and gives us an alcoholic pause that refreshes. Two years ago, before The Bitter Southerner was launched, we had the idea to challenge great Southern bartenders to create a cocktail called The Bitter Southerner. Perhaps we were drunk when the idea arrived, but not so drunk that we do not today remember all the barkeeps we asked. Miles Macquarrie was on that list. Two years ago, he was behind the bar at Leon’s Full Service in Decatur, Ga., and I often sat on a stool directly in front of his station, down in the left heel of Leon’s horseshoe-shaped bar. It was a cramped little space — the only two stools at the bar that faced the back wall instead of into the middle of the horseshoe — but it was probably my favorite spot in town at the time. Watching Miles Macquarrie make drinks is like watching a highly trained athlete going through his paces. The guy even admits to a nagging case of tennis elbow that doesn’t come from swinging a racket: It comes from shaking drinks. One day, I told Macquarrie about our hope to create a numbered series of cocktails called The Bitter Southerner. I asked him if he would contribute a cocktail. I wasn’t really surprised. I had watched Miles work (and consumed the results of his work) for long enough to know that he put a great deal of thought and work into every drink he pushed across his bar. So I waited. Had to leave the mad scientist to his research, I supposed. While I waited, Macquarrie and three partners opened a new restaurant called Kimball House in Decatur’s old train depot. Eater.com quickly plopped Kimball House onto its list of the “hottest cocktail bars in America,” and the restaurant was nominated for the James Beard Foundation’s Outstanding Bar Program award. What Miles was telling me was that he’d done far more than just given the drink some thought. 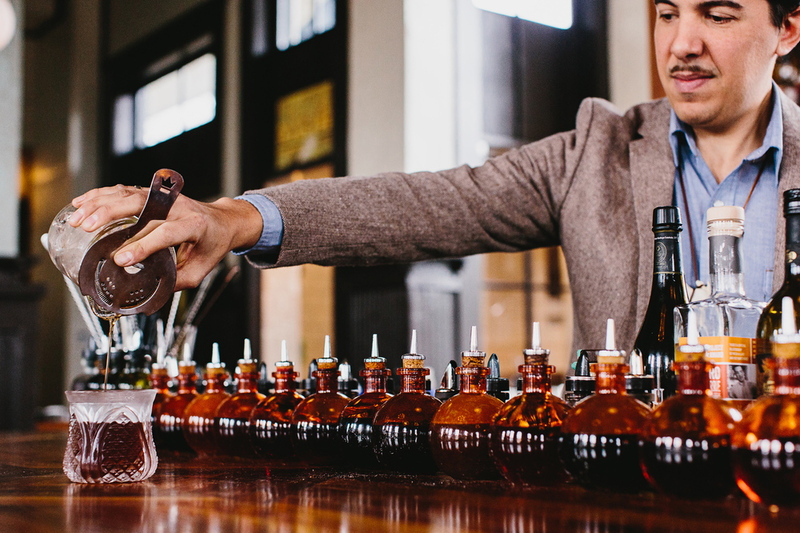 He’d actually gone so far as to work with a distiller 3,000 miles away to create an amaro, an Italian-style herbal liqueur, based on the flavors of Atlanta’s favorite drink, Coca-Cola — and then produce 20 cases of the stuff. So if you’re a Pepsi drinker, you’re SOL on this one, unless you are willing — as you should be — to lay down your prejudices in the name of deliciousness. Fellow cocktail lovers, after great thought and much effort on the part of Miles Macquarrie, say hello to The Bitter Southerner No. 5. Before we get into the bitter, sweet and spirituous elements of The Bitter Southerner No. 5, we must discuss method for a moment, because with Miles Macquarrie, good method matters just as much as good ingredients. “Technique's always been the biggest thing, I’ve learned, that changes how drinks work,” Macquarrie says. So I stopped in at Kimball House one afternoon to talk technique with Miles. Because the No. 5 contains no fruit juices that need to be emulsified, it is stirred, not shaken. Stirring up a cocktail seems easy enough. Dump the ingredients and ice into a glass and stir until cold, then strain it into the glass you’ll drink it from. In the world of Macquarrie, however, it’s not that simple. The answer, Macquarrie says, is 24 degrees Fahrenheit. That’s right, when the ideal cocktail hits your lips, it should be 8 degrees below the freezing point of water (an achievement made possible, of course, by the fact that the freezing point of pure ethanol alcohol is -114 degrees). As for dilution, it’s easy enough to figure out that by stirring a drink, you not only chill it but also dilute it as the ice melts. But how much dilution is enough? Too little dilution can leave a cocktail with too much alcoholic bite, and too much dilution leaves the drink watery and uninteresting. The answer, Macquarrie has determined after years of research, lies in the ice you use, how precisely you use that ice and how long you stir to reach the right temperature and dilution. To illustrate, I asked Miles to explain precisely how he would make a Manhattan, one of the basic stirred drinks. “I think the best way to make a Manhattan is keep your mixing glass in the freezer,” he said. “Say we start making a Manhattan. We'll do an ounce of vermouth in a completely frozen mixing glass. Then we'll add our bitters. Then we'll crack four one-inch cubes of ice. If you crack it, you have all of this surface area that's completely dry, you know, because the cubes are dense. Even if you have water dripping off of the outside, if you break it, that inside's never seen air. It's completely dry. Now you have all of this super cold surface area. Macquarrie’s theory is that for stirred drinks, getting the temperature down to between 24 and 28 degrees means your dilution is perfect. Now, that doesn’t mean that you’ll see bartenders at Kimball House stick a thermometer in every drink before it’s served. “You can watch your wash line,” he says. “If you see the cubes sink down and your liquid come up when you're stirring a drink, that's basically your wash line. You know that you're getting dilution. When we're training new bartenders on stirred stuff, we keep one of those little thermometers and they'll stick it in and we always say 28 degrees Fahrenheit and you're good.” After that training, though, the bartenders work just by watching their wash lines rise. After you try it a few times with a thermometer, you’ll be able to go without, too, just by watching what’s going on in your mixing glass. My question, of course, was: Is all this trouble worth it? So I went home and stuck a mixing glass and a cocktail glass in the freezer for a while and got out my trusty kitchen thermometer. Then I made a Manhattan with the same bourbon and the same vermouth I always use, but following the Miles Method to a T. I put vermouth and bitters into the frozen mixing glass. I cracked four ice cubes into the glass, and then topped that with more whole cubes. I then poured the bourbon slowly over the ice. I stirred for a full minute and strained the drink into my frozen cocktail glass. I stuck the thermometer into the finished drink and watched it settle at precisely 24 degrees. So Macquarrie was right about the temperature, but how would the drink taste? In a word, perfect. The silkiest, loveliest, coldest Manhattan I’d ever stirred up. As you make your own Bitter Southerner No. 5 at home, follow the Miles Method. It turns mere greatness into perfection. So herewith, the bitter, the sweet and the spirituous of The Bitter Southerner No. 5. The aforementioned Brovo Amaro Macquarrie is the primary bitter ingredient in the BS 5. Those flavors include nutmeg, vanilla, cinnamon, coriander, gentian root and the zests of lemon, lime and orange. The gentian gives the amaro its bitterness. The finished product is basically clear with a little cloudiness, with none of the darker color of most amaros — or Coca-Cola, for that matter. But bring it to your nose, and you’ll get a very familiar smell — just without the bubbles from carbonation. Taste it and, to borrow a phrase from Macquarrie’s words, you’ll taste “60-proof Coca-Cola,” but with a mild yet distinctive bitter note. Amaro Macquarrie is on the shelves of Decatur-area liquor stores, but if it hasn't made it to your city yet, you can substitute Amaro Nonino for the closest approximation. The BS 5 gets some additional bitterness to anchor it from four dashes of Angostura Bitters. Two of the BS 5’s ingredients — vermouth and sherry — have some sweetness to balance the bitterness of the amaro and the bitters. 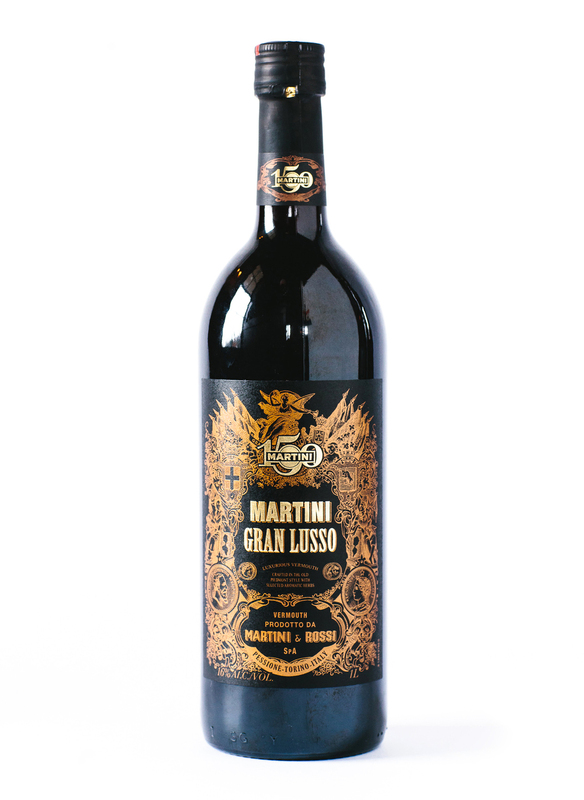 For the vermouth, Macquarrie chose Martini & Rossi Gran Lusso Vermouth, a product relatively new to the market but pretty widely available. “It's real cool stuff,” Macquarrie says. “It’s their high-end vermouth. They released it to commemorate their 150 years as a vermouth distillery. It's got these really cool herbal complexities to it.” The vermouth uses Italian Barbera red wine as its base, and Macquarrie says its flavor profile is quite different than that of the gold standard high-end sweet vermouth, Carpano Antica Formula. Our recommendation is to spend a little time tracking down the Gran Lusso, which retails for about $30 per liter. And if you can’t find it, substitute a lighter-bodied sweet vermouth, such as Dolin or Martini & Rossi’s standard sweet vermouth. The sherry Macquarrie chose is Lustau East India Solera Sherry, where retails for about $30 a bottle and is relatively easy to find in better liquor and wine shops. Solera actually refers to the aging method instead of flavor. Any wine or spirit aged solera-style is aged in a barrel and then blended, in fractions, with older stuff in other barrels. What you wind up with is a mixture of ages that grows increasingly complex in flavor as the process continues over many years. If you can’t find Lustau, any solera-style sherry can serve as a substitute. If you think Macquarrie’s own special amaro, modeled after the flavor profile of Coca-Cola, isn’t enough to anchor the BS 5 in the South, the whiskey will take care of that problem for you. 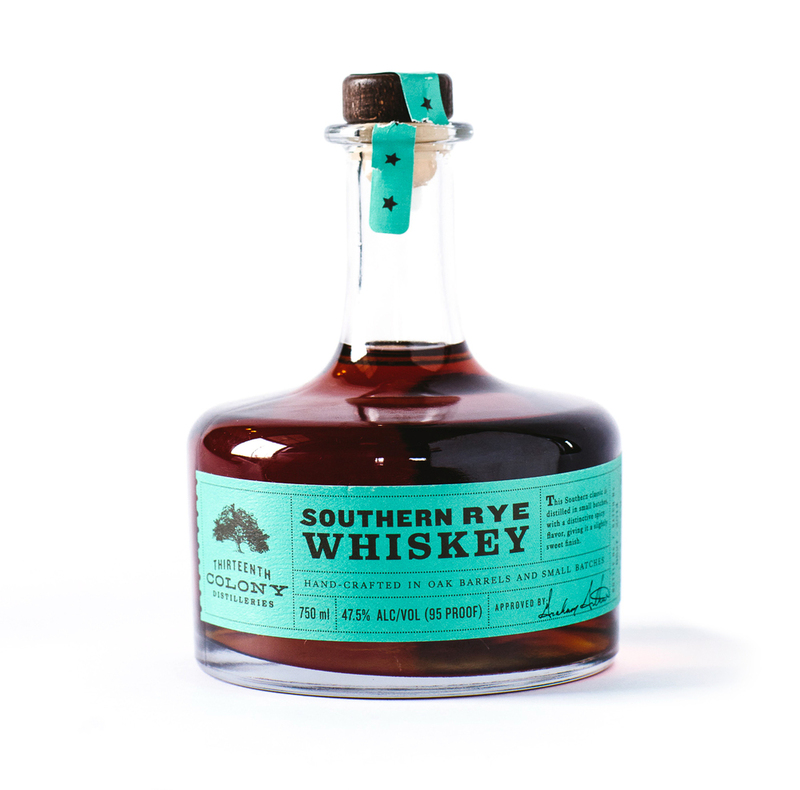 For the BS 5, Macquarrie chose a rye whiskey from pretty close to home: the Southern Rye Whiskey from Thirteenth Colony Distilleries in Americus, Ga.
Thirteenth Colony took the harder but nobler route, making rye whiskey themselves and aging it themselves in Americus until it was ready to sell. The stuff is great sipping whiskey for those who like ryes, and in The Bitter Southerner No. 5 it gets totally magical. So let’s make this thing, shall we? First, put a mixing glass and your serving glass — a good, heavy, double old-fashioned glass — into the freezer. (Macquarrie says he skipped the stemmed cocktail glass because he figured Bitter Southerners might have had enough of the “girly glassware.”) Leave them in the freezer at least long enough to get completely frosted. Stir for at least 45 seconds or up to a minute. Take your frozen old-fashioned glass out and strain the contents of the mixing glass into it. And if you’re so inclined, you can stick a thermometer in it. You know, for safety’s sake. Take a lemon and orange and cut a wide strip of peel from each one. Squeeze the lemon peel over the drink to express the oils on the surface, then toss the lemon peel in your compost bucket. Do the same with the orange peel. The Bitter Southerner No. 5 might just be the most complex and refreshing slug of brown liquor you’ll ever try.